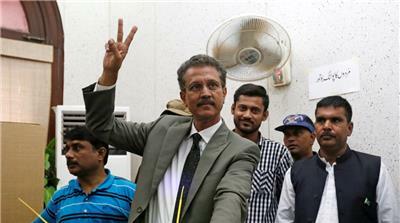 The mayor of Pakistan’s largest and most populous city has vowed to run his office from prison after being arrested on charges of sedition and terrorism. He vowed to seek his freedom in court but said if he is denied, he will “solve the public’s problems from jail”. Under Pakistani law, politicians can govern while in police custody but it is not yet clear how Akhtar will be able to work as mayor from prison. He said he would ask the chief minister of Pakistan’s Sindh province to allow him to open an office in jail and make “new rules” so that people would be granted access to him. Security forces arrested MQM officials while demolishing its illegal offices and sealing the head office, accusing them of torture, murder and racketeering. “Akhtar is Karachi’s mayor, he carries a lot of responsibilities. How can he be put in jail?” Barrister Saif Ali Khan, an MQM leader, told. On Tuesday, Pakistan’s Ministry of Interior said that it was seeking legal action against Hussain in London. A ministry statement said that the government had sent a dossier on Hussain to British authorities, with allegations of inciting violence and disturbing the law-and-order situation in Pakistan. “I think they [MQM] will have to work really hard to dissociate themselves from the criminal elements,” Sharmila Farooqi, Pakistan People’s Party’s member of Sindh provincial assembly, told. MQM has been on damage control by detaching itself from the London secretariat and endorsing itself as a Pakistan-based political party. Its leadership in Pakistan is also shrinking as a lot of MQM members, including sitting members in the provincial and federal assemblies, have parted ways and joined rival political parties. But the major setback to MQM has been the arrests of its party workers on terror charges and closure of many of its offices across Karachi and Hyderabad. Despite that, MQM still has a lot of backing and a lot of people are still ready to vote for it, with or without Hussain. This is because the party has provided them basic facilities and financial support. This remains the only hope for Sattar and whatever is left of the who continue their efforts of bringing MQM back on track in the political race.